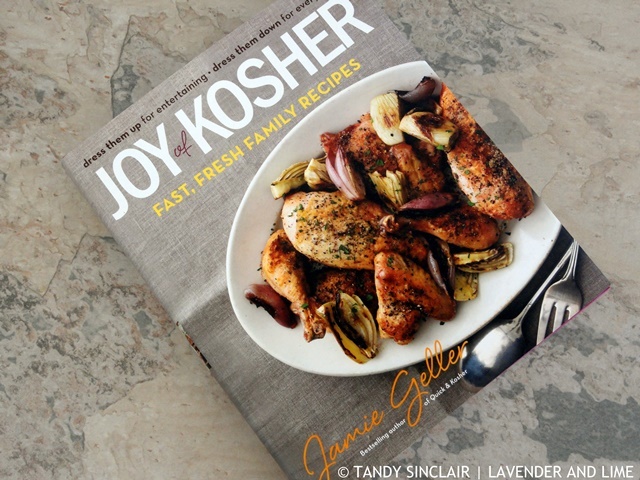 Joy Of Kosher is Jamie Geller’s second book. Better known as the ‘bride who knew nothing’, here Jamie gives us her tried and tested recipes for Kosher cooking. Mother of 5 Jamie wishes G-d will perform a miracle and clean her kitchen. She loves her family and food and this is self evident in her writing and her recipes. The core recipes can be dressed up or down, adding versatility and adaptability. Use the dressed down versions for quick family meals or dress them up for high days and Holy days. Jamie includes a list of equipment and ingredients necessary to make her recipes. As I am not Kosher I have never had to look for a butter substitute and I never use margarine. If you are Kosher, or vegan for that matter, look for a plant based substitute – Jamie uses Earth Balance Buttery Sticks. The book is littered with stories and anecdotes which makes Jamie feel like the girl next door. Each recipe has the Kosher status and some include quick tips and time saving advice as well as wine pairing notes, all Kosher of course. It ends with a food glossary and Hebrew/Yiddush/Yinglish glossary. Each recipe in Joy Of Kosher has its own photograph and there are wonderful family photos throughout the book. The recipes list whether they are meat, pareve or dairy. Pareve foods can be eaten with meat or dairy but meat and dairy cannot be mixed in Kashrut. The books begins with soups and starters and is followed by sides and salads. In the mains chapter the recipes are divided into poultry, meat, fish and vegetarian. Given my family background I should try and make Daddy’s Mitites (p217) which are Romanian garlic meat sausages. I also love the sound of the Country Spinach, Tomato and White Bean Soup (p248). Desserts include Sweet Potato Latkes (p262) and Big Chewy Dark Chocolate Chunk Cookies (p277) as well as Salted Almond and Pistachio Bark (p279). 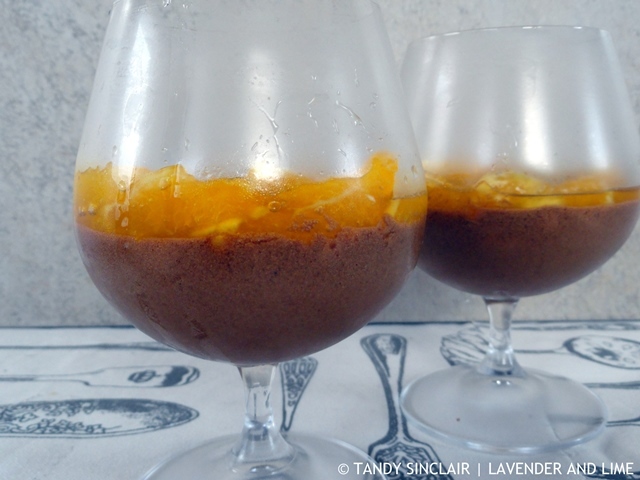 The Olive Oil Dark Chocolate Mousse (p285) is an amazing recipe that I have tested and will share. Come December I will try my hand at the Cardamom Scented Chanuka Cookies (p295). There is an entire section dedicated to Challah. From the 1 dough recipe Jamie makes 10 sweet and savoury recipes and I have used this recipe with great success. Jamie prays for her family as she kneads the dough which is why she does it by hand. In Joy Of Kosher we are told the story behind Challah and why we burn off a piece. The book gives the basics for making Challah and I made a variation of the Sun-Dried Tomato, Garlic, and Herb Braided Challah (p331) for a few family meals. I also intend to make the Gooey Pecan Sticky Buns (p344) soon. The holiday menus makes mention of the 130 special meals Jews have during the year, including Shabbos. Jamie gives ideas of menus from the recipes in her book with a huge emphasis on Pesach. The most noticeable of all things is that Jamie uses a lot of cooking spray in her recipes, as well as preprepared ingredients. The recipes are mostly simple and the most difficult aspect for me is that the book does not use the metric scale. This books sounds like an amazing book. I don’t have too many cookbooks and I definitely want to own this one. What an interesting book! I love cookbooks that are filled with pictures and stories of the person who wrote them. I’m not really familiar with Kosher cuisine, so I’d definitely like to check out a book like this! I’m with you Tandy, I love the idea of country spinach as well. I just love spinach. I must see if I can check out this book in Barnes & Noble this weekend. Totally enjoyed this post. Hi Tandy, this cookbook sounds wonderful and I really enjoyed your review. Makes me want to go out and buy this book today. I think I’d really enjoy reading more about the section on Challah in her book! Tom has a huge Jewish population at his school, so beyond getting off all the Jewish holidays which is unusual, he also learns a ton about food! It’s fun. Sounds like a great book. Sounds like an incredible book Tandy.